Philip Henry Kerr, the eldest of five surviving children, was born in London on 18th April 1882. His father, Ralph Drury Kerr (1837–1916), the son of the 7th Marquess of Lothian, was an army officer, and his wife, Lady Anne (1857–1931), was the youngest daughter of Henry Granville Fitzalan-Howard, 14th Duke of Norfolk. Kerr's parents were devout Roman Catholics and in September 1892, he was sent to Cardinal Newman's foundation, the Oratory School at Edgbaston. For many years Kerr believed he had a vocation to be a priest, but religious doubts had already surfaced by the time he entered New College in October 1900. In 1904 he gained a first-class degree in modern history, but he was an unsuccessful candidate for a fellowship at All Souls College later that year. Sir Arthur Lawley, lieutenant-governor of the Transvaal Colony, had served under Ralph Drury Kerr in the 10th Hussars offered Kerr a post as his assistant private secretary and aide-de-camp. Kerr arrived in Pretoria in February 1905. Two months later he became assistant secretary to the inter-colonial council and railway committee of the four South African colonies. He was also secretary to the standing committee on the South African constabulary from December 1905, and secretary to the indigency commission from September 1906. In December 1908 he began editing a new monthly journal, The State , which was to be published in both English and Dutch, and was part of the campaign for the unification of the South African colonies. Alfred Milner and Lionel George Curtis established the the The Round Table: The Commonwealth Journal of International Affairs, a journal to promote closer union between the United Kingdom and its self-governing colonies. Kerr, who had worked under Milner and Curtis in South Africa, was employed to edit the journal on the salary of £1,000 a year. According to his biographer, Alex May: "The first issue of the Round Table appeared in November 1910, with a long article by Kerr entitled Anglo-German Rivalry and contributions from other members of the Round Table network.... Most of his articles were lucid and persuasive, although many were sometimes also long-winded. During his time as editor his views changed significantly, both on the need for and practicability of imperial federation, and on what, following the terminology of the time, he described as the relations between ‘advanced’ and ‘backward’ peoples. Southern and eastern Africa were always for him (as for other members of the Round Table) a blind spot. Nevertheless, Kerr soon came to recognize the need for the gradual extension of representative government in Britain's other imperial dependencies." Kerr continued to edit the The Round Table during the First World War. Kerr was also involved in the plot to oust Herbert Asquith from power in 1916. Alfred Milner, who was also involved, arranged for David Lloyd George, the new prime-minister, to appoint Kerr as his new private secretary. Alex May points out: "Kerr's initial responsibility was for labour questions, but he was soon given responsibility for imperial and foreign affairs. His primary duty was to summarize and advise on the large quantity of documents submitted to the prime minister by other parts of the government machine, but he was increasingly called upon to act as Lloyd George's adviser and intermediary. His influence on Lloyd George's policy on such matters as war aims, relations with the dominions, and the development of schemes for a League of Nations was considerable." Winston Churchill blamed Kerr for persuading Lloyd George to reject his scheme for larger-scale allied intervention against the Bolsheviks during the Russian Civil War. Kerr resigned as Lloyd George's private secretary in March 1921 in order to become managing editor of The Daily Chronicle and a director of United Newspapers Ltd, which the prime-minister controlled. Kerr resigned in February 1922, but remained a strong supporter of Lloyd George. The main reason for leaving this post was to devote more time to religious study. Three months later he told Lionel George Curtis that he had joined the Christian Science Movement. In a letter dated 28th May, 1922 he wrote that he was "convinced that Christian Science is the real key to all our problems, political and economic, no less than personal". Over the next few years Kerr wrote articles for the Christian Science Monitor and other newspapers. He also carried out lecture tours of the United States. He turned down the offer of becoming foreign editor of The Times, but in July 1925 he was persuaded to take on the secretaryship of the Rhodes Trust at a salary of £2,000 a year. His appointment resulted in the resignation of Rudyard Kipling as a trustee. Like many others on the right wing of British politics, Kipling held Kerr personally culpable for the empire's retreat in India. On 16th March 1930, Kerr succeeded his cousin Robert Schomberg Kerr as the Marquess of Lothian. He also inherited a considerable amount of property including Ferniehirst Castle, Newbattle Abbey and Blickling Hall. Kerr was considered an eccentric character and is remembered for arriving for the coronation of George VI in a battered Austin Seven. In the 1930s Lord Lothian argued for closer cooperation between Britain and the United States. In his lecture, Pacifism is not Enough, nor Patriotism Either (1935), he suggested that an Anglo-American bloc would prove to be the cornerstone of an eventual world commonwealth. Lothian believed that Britain was not a part of Europe: she had a distinct history and a separate destiny. He thought that Europe should be united, but without Britain. Lothian was a critic of the Versailles Treaty and felt that Germany had been harshly treated. Lothian met Adolf Hitler in January 1935 and returned to pronounce himself convinced that "Germany does not want war and is prepared to renounce it absolutely … provided she is given real equality". Lothian was seen as a leading supporter of appeasement and when Hitler reoccupied the Rhineland in March 1936, Lothian was reported as saying that the Germans were only occupying "their own back garden". However, his view changed in 1938 and he wrote to Lord Halifax urging him to make clear that British government would side with Czechoslovakia if Nazi Germany resorted to force. In March 1939, Lothian admitted that he now realized "that Hitler is in effect a fanatical gangster who will stop at nothing to beat down all possibility of resistance anywhere to his will" and called for a "grand alliance" against aggression. Neville Chamberlain appointed Lothian as British ambassador in Washington. He took up the post on 30th August 1939. The outbreak of the Second World War took place four days later. His biographer, Alex May, has commented: "Lothian had aristocratic charm, but democratic ideals; he loved America, and had travelled through it extensively; he had a wide range of contacts, in government, the universities, and journalism; and he was adept at the art of presentation. His appointment was criticized by Americans who identified him with appeasement; by others who suspected that he would use his guile to induce Americans to fight for the preservation of the British empire; and by many Foreign Office officials who suspected, rightly, that Lothian would be difficult to control." On 14th December, 1939, Lothian wrote to Lord Halifax: "American opinion is still... almost unanimously anti-Nazi. In addition it is now almost more strongly anti-Soviet. It is to a much less degree pro-French or pro-British. There are formidable elements which are definitely anti-British which take every opportunity to misrepresent our motives and attack our methods.... I have no doubt that the best corrective is the fullest possible publicity from England and France through the important and high class American correspondents of what the Allies are thinking and doing." 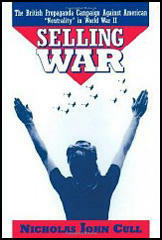 Nicholas J. Cull, the author of Selling War: The British Propaganda Campaign Against American Neutrality (1996), has pointed out: "Lord Lothian was a master of the American scene. Always accessible and disarmingly frank, he charmed the press corps... He also enjoyed the able counsel of John Wheeler-Bennett and Keith Officer, in Australian diplomat assigned to advise the ambassador on matters of public opinion. With their advice, he began the work of explaining Britain to America and, no less importantly, America to the British.... 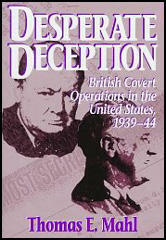 Although his predecessor, Lindsay, had urged him to adopt a low profile, he refused to allow the British case to be lost by default, and lie spoke to good effect throughout the Phony War. He began by tackling allegations of propaganda head-on: contrasting German propaganda and British publicity." Lord Lothian enjoyed a good relationship with senior figures in the press world such as Arthur Hays Sulzberger, Walter Lippmann and Helen Ogden Reid. However, he was careful not to give the impression that he was not involved in any campaign to bring the United States into the Second World War. He told his friend, Frederick Whyte: "Whilst no propaganda is still our watch word so far as the United States is concerned, this does not mean that we are not doing our best to make accurate information on our aims and actions available to those who are misinformed." Lothian explained to the Chicago branch of the Council on Foreign Relations in January 1940: "Propaganda is the deliberate attempt to influence your countrymen or other nations to a particular course of action, by lies or half truths or tendentious innuendos. The truth is never propaganda; it is the staff of life." William Stephenson, the head of British Security Coordination (BSC), arrived in the United States in June, 1940. He knew that with leading officials supporting isolationism he had to overcome these barriers. His main ally in this was another friend, William Donovan, who he had met in the First World War. "The procurement of certain supplies for Britain was high on my priority list and it was the burning urgency of this requirement that made me instinctively concentrate on the single individual who could help me. I turned to Bill Donovan." Donovan arranged meetings with Henry Stimson (Secretary of War), Cordell Hull (Secretary of State) and Frank Knox (Secretary of the Navy). The main topic was Britain's lack of destroyers and the possibility of finding a formula for transfer of fifty "over-age" destroyers to the Royal Navy without a legal breach of U.S. neutrality legislation. Lord Lothian supported this campaign and told President Franklin D. Roosevelt on 28th July, 1940, and told them that Britain had entered the war with 176 destroyers and that only 70 of these were still afloat. He requested 40 to 100 destroyers and that only 70 of these were still afloat. He also requested 40 to 100 destroyers and 100 flying boats. On 22nd August, 1940, Stephenson reported to London that the destroyer deal was agreed upon. The agreement for transferring 50 aging American destroyers, in return for the rights to air and naval basis in Bermuda, Newfoundland, the Caribbean and British Guiana, was announced 3rd September, 1940. The bases were leased for 99 years and the destroyers were of great value as convey escorts. Lord Louis Mountbatten, the British Chief of Combined Operations, commented: "We were told that the man primarily responsible for the loan of the 50 American destroyers to the Royal Navy at a critical moment was Bill Stephenson; that he had managed to persuade the president that this was in the ultimate interests of America themselves and various other loans of that sort were arranged. These destroyers were very important to us...although they were only old destroyers, the main thing was to have combat ships that could actually guard against and attack U-boats." Lord Lothian suffered from a kidney infection but because of his Christian Scientist beliefs, he refused medical treatment. He died on 12th December 1940. The post-mortem recorded Lothian's death the next day as being due to uremic poisoning. One politician recorded that he was "another victim for Christian Science." Raymond Gram Swing advised Winston Churchill to appoint someone who held similar interventionist beliefs as Lothian. He ignored this advice and appointed the man who developed the former prime minister's appeasement policy, Lord Halifax. American opinion is still ... almost unanimously anti-Nazi. In addition it is now almost more strongly anti-Soviet. It is to a much less degree pro-French or pro-British. There are formidable elements which are definitely anti-British which take every opportunity to misrepresent our motives and attack our methods.... I have no doubt that the best corrective is the fullest possible publicity from England and France through the important and high class American correspondents of what the Allies are thinking and doing. Whilst no propaganda is still our watch word so far as the United States is concerned, this does not mean that we are not doing our best to make accurate information on our aims and actions available to those who are misinformed. Lord Lothian was a master of the American scene. Always accessible and disarmingly frank, he charmed the press corps... He also enjoyed the able counsel of John Wheeler-Bennett and Keith Officer, in Australian diplomat assigned to advise the ambassador on matters of public opinion. With their advice, he began the work of explaining Britain to America and, no less importantly, America to the British. From the outset, Lothian determined to stretch the boundaries of the "No Propaganda" policy. Although his predecessor, Lindsay, had urged him to adopt a low profile, he refused to allow the British case to be lost by default, and lie spoke to good effect throughout the Phony War. He began by tackling allegations of propaganda head-on: contrasting German propaganda and British publicity.